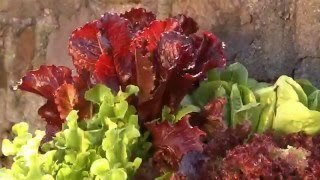 Five classic lettuce types and textures in a range of colors-Black-Seeded Simpson, Lollo Rossa, Red Salad Bowl, Royal Oak Leaf and Salad Bowl. These lettuces are all as beautiful as they are delicious and make for delightful salads, rich in color, flavor and texture. Lettuce, Looseleaf Blend is rated 4.5 out of 5 by 12. Rated 5 out of 5 by HudsonValleyNY from Growing Enough to Share! Using seeds from 2017. Didn't grow well last year, but I raised the size of the beds, so also bumped up the soil with more compost and sphagnum moss. Started some indoors under lights in early March, also seeded directly in beds. Better germination with indoor transplants, but all are producing so well that I thin them once or twice a week and have been able to share with our neighbors. Lovely leaf blend, keeps well when placed in very cold water right after cutting for a good soak. Rated 5 out of 5 by Victoria 959 from Awesome Lettuces! This will be the 3rd year I've planted this blend! My seeds for last year were leftover from the previous year and I could not tell the difference! Each variety included is delicious, prolific, and colorful in the salad bowl, and by doing succession planting, and Spring as well as Fall crops, I harvested almost the entire season! The rabbits even ate some of it, and that kept the little monsters out of my other veggies! 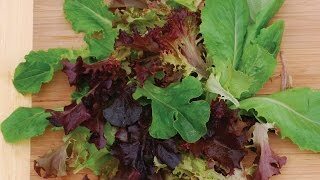 This is definitely my favorite leaf lettuce blend, and I am restocking this Spring! Rated 5 out of 5 by Rjohnson26 from Still productive I have enjoyed lots of salads and shared with family and friends. Very pleased. Rated 5 out of 5 by Pleasant Valley from Pacific Northwest Zone 7 Powerhouse Producer! Grew wonderfully in a raised bed augmented with cow manure and organic compost. Only purchased 1 seed packet, and staggered plantings every 3 weeks from mid-May through late June. VERY PLEASED with both the quantity produced and quality of the product. My family of 4 was easily fed for 2 months, and I gave away approximately 30 gallon bags to friends and co-workers as well. Bought again for fall planting, and will definitely be buying for years to come. Rated 5 out of 5 by Bwright from VERY easy to grow I grew these in a raised bed the first season and in small pots on a hot, sunny deck last season. I could not have been lazier in my seed application--I sprinkled as I saw fit and mixed them lightly into the soil, then watered as needed. They grew beautifully in both areas and kept growing through the summer and into winter. A few freezes finally killed off the deck plants this season, but they lasted through November-ish, which was a pleasant surprise. The fall planted lettuce did not bolt at all, and was crisp and plentiful. The pots were literally overflowing with lettuce from Aug - Nov, and the lettuce grew back consistently as we snipped leaves. Rated 5 out of 5 by Shellady from Love this packet I directly sowed in soil amended with my own compost in spring in a salad box. Came up beautifully. Even a baby Robin loved to use the lettuce to hide in! Beautiful colors and delightful flavors. Have started another crop in the same box (late Aug. - early Sept.) and the box is growing good. Will continue to plant in the spring. Rated 5 out of 5 by irelamanda from Mass producer This grew very well, and come back each year. Very very pretty around our patio! Rated 5 out of 5 by sunflowerlover from Great Product The taste was very good, and these plants were very easy to grow. I will definitely plant these again.